Global Residential Boiler Market size in 2016 was valued over USD 9 billion and annual unit installation is set to reach over 10 million units by 2024. Ongoing investments toward residential construction coupled with growing demand for efficient space heating systems will drive the residential boiler market size. In 2016, total investment towards residential building construction in China was valued over USD 1 trillion. Government ambitious plan towards zero emission buildings will lead to replacement of traditional heating systems with efficient boilers. Growing concern towards greenhouse gas emissions coupled with measures to reduce carbon footprints will foster the residential boiler market share. According to Environmental Protection Agency, in 2015, the U.S. residential and commercial sector accounted for over 12% of total GHG emissions. Introduction of codes and standards toward adoption of energy efficient space and water heating technologies will further embellish the business growth. Economic revival in Europe and Latin America along with increasing demand for space heating will fuel the residential boiler market growth. Efforts to improve gas accessibility coupled with favorable government initiatives toward adoption of energy efficient heating systems will further thrust the product demand. However, growing popularity of solar space heating technologies may act as a restraint for industry growth. Ongoing measures toward energy conservation coupled with mandate toward minimal efficiency requirements will drive the condensing residential boiler market growth. The Ecodesign directive 2009/125/EC introduced by the European Union underlines the ecological requirements for all energy related products. Government measures to curb residential energy consumption will further complement the business outlook across developed economies. Non-condensing residential boiler market size in 2016 was valued over USD 4 billion. Ability to operate under extreme climatic conditions and compact design are some of the key features which make its adoption preferable over other available counterparts. Ease of installation and minimum maintenance cost of the system will further propel the industry growth. 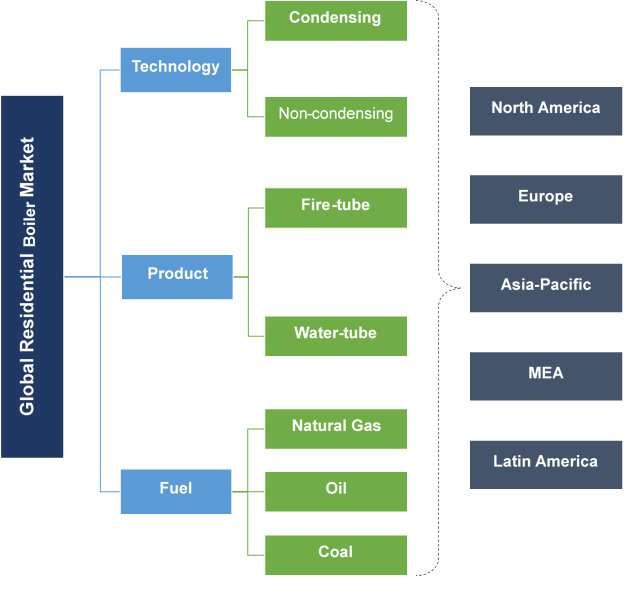 Water-tube residential boiler market is predicted to exceed 9 million units by 2024. Growing popularity of hydronic underfloor heating systems coupled with better safety features will stimulate the product demand. High efficiency and ability to handle high pressure will further complement the industry outlook. Natural gas in 2016 accounted for over 50% of residential boiler market revenue. Improved safety and less space requirement features makes gas fired boilers preferable over available alternatives. Competitive pricing of natural gas, minimal maintenance cost and low pollution content will further boost the product penetration. Oil fired residential boiler market in 2016 was valued over USD 2 billion. Limited accessibility of natural gas in developing economies coupled with growing popularity of central heating systems will foster the product demand. High efficiency of these systems along with retrofitting and replacement of existing heating units across developed countries will further augment the business growth. U.S. residential boiler market is set to reach over 600 thousand units by 2024. Government focus toward limiting carbon emissions coupled with growing popularity of condensing boilers are some of the key drivers which will propel the industry growth. In March 2016, Department of Energy amended the minimum efficiency requirements for residential boilers. These standards will be effective from January 15, 2021 and will require all gas fired hot water boilers to have minimum annual fuel utilization efficiency (AFUE) of 84%. 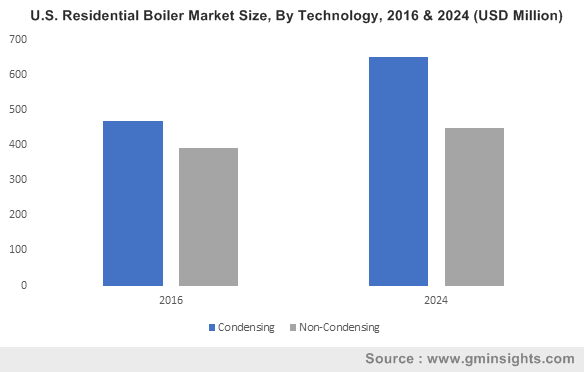 China residential boiler market will witness strong growth owing to ongoing construction spending towards residential establishments. Efforts to reduce carbon emissions across the urban centers in the country will further lead to replacement and retrofitting of existing heating units. According to National Development and Reform Commission, in 2016 natural gas consumption in the country rose to 205.8 billion cubic meters. Germany in 2016 accounted for over 14% of Europe residential boiler market revenue. Supportive government policies towards high efficiency boiler installations coupled with retrofitting and replacement of traditional heating units will fuel the product demand. Under the Energy-Efficient retrofitting scheme, home owners are provided with 10% grant for investing in oil or gas fired condensing boilers. Key industry participants include Slant/Fin, Bosch, AC Boilers, HTP, Lennox, Viessmann, ACV, Buderus, ECR, NTI Boilers, PB Heat, Navien, Bradford White and Baxi. Other prominent players include Parker Boiler, Weil-McLain, Burnham Holdings, A.O. Smith, Siemens AG and Saudi Boilers. Industry players as a part of strategy are focusing toward product diversification and product assortment. Companies are modifying existing product lines and launching new products to meet the customized product demand. Boilers are enclosed metallic vessels which provide hot water and steam for various applications. These systems transfer the heat to water which is then circulated through radiators or other devices for space heating purpose. Oil, natural gas and coal are some of the commonly used fuel for firing these units. Efforts towards reducing emissions coupled with growing concerns toward urban air quality will further fuel the business growth.